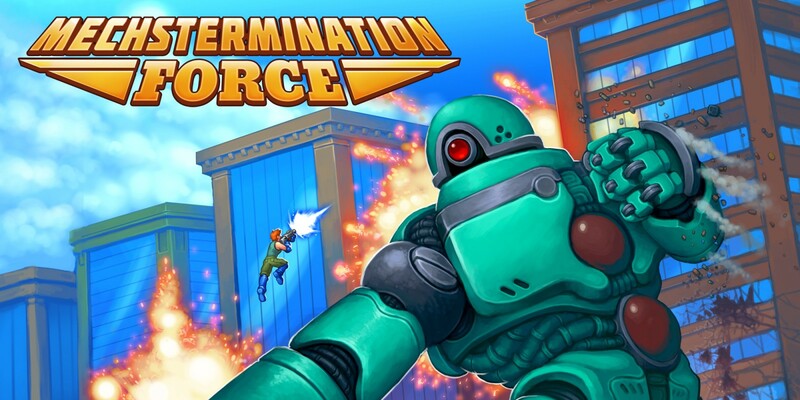 The title Mechstermination Force already sounds quite captivating and somewhat impressive and truth be told, when looking at the actual gameplay those are perhaps two great terms to describe this bite-sized title. This new Switch title is a console exclusive and is a 2D action shooter that’s all about taking down massive mechs that try to destroy the world. You, and a friend, are the only things that stand in the way of certain doom. We put on our bandana, lit a cigar and locked and loaded our weapon for this boss battler on the Nintendo Switch. The story of the game is quite simple. The Earth is under a massive threat by gargantuan mechs that simply want to destroy our planet. You seem to be the only decent soldier that is well-versed in destroying robots. There is little to no story value to be found in the game, you’ll just go from one level to the next, with a minimum of conversations in-between. The game could have been spiced up with a bit more story content, but truthfully the game fares just as well without the inclusion of a thicker plot. Mechstermination Force has a rather comical style to represent the characters, the surroundings and the giant mechs you’ll have to take down. The game is very colorful, but the color tones are rather warm than flashy and all over the place. The different bosses are nicely designed and are all unique, making them stand out from one another, making sure the game feels refreshing during each battle. There aren’t that many different environments to explore, as most levels are quite small, but most have a nice background, and certain levels in which you have to move have fun designed obstacles. Overall the game looks very appealing, which is a definite plus to press on when dying over and over. The music in Mechstermination Force is quite upbeat but also cinematic for such a small title. 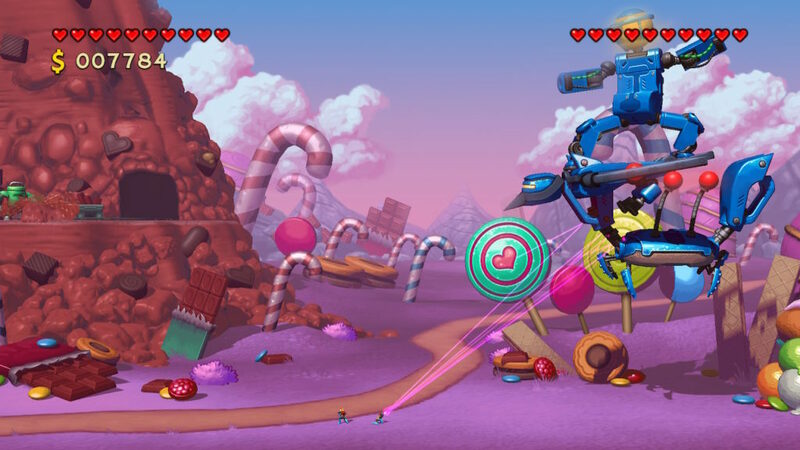 The game offers a fun soundtrack with a dozen of tracks. Other than the sound effects there is not much in terms of other sound design. The game is void of any voice acting, which is a shame, as it could have added a bit of value to this tiny production. 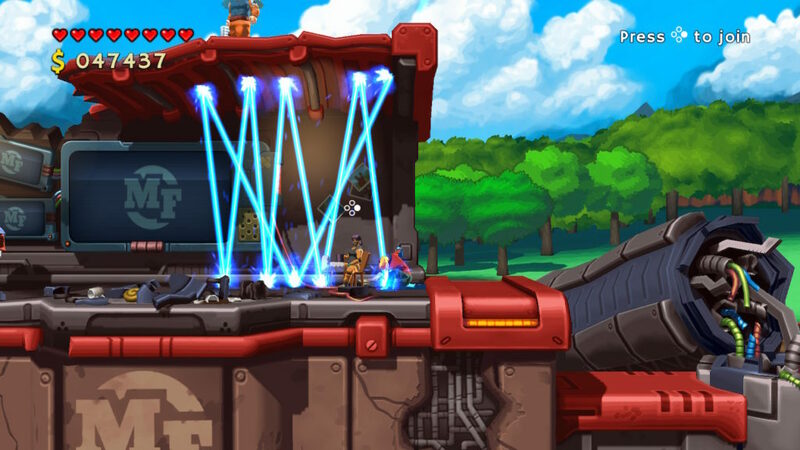 On paper Mechstermination Force is a 2D action shooter, but in a boss-rush format. You’ll only be fighting bosses alone, or with a friend in local co-op. The bosses consist out of different phases, making them quite interesting to beat. The offset of the game is actually quite simple. 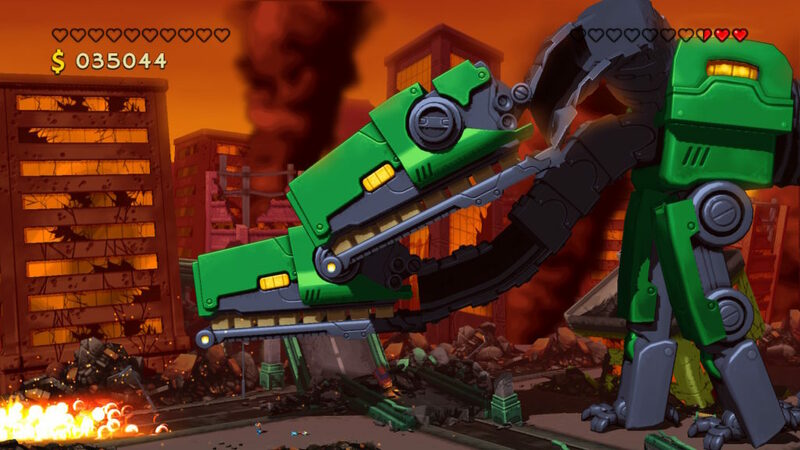 You’ll start by picking a level (of the available ones) and you try to kill the giant mech in front of you. You’ll have to destroy shields, which can be destroyed with your ranged weapon, and cores, which can be destroyed with your melee weapon. You’ll quickly learn which is which and when you’ll need to use which of your weapons. You start off with one of the four characters you have selected, which only have cosmetic differences. In the beginning of the game you’ll have to make do with a basic ranged rifle and no real abilities. As the game progresses you’ll be able to cling to metal surfaces, get a double jump etc. You’ll also earn credits by defeating bosses, which allow you to unlock more health (permanently and temporarily) and new weapons. The game is basic in its mechanics, but sometimes jumping and aiming feel a bit clumsy and ‘off’. It takes some time to perfectly time your jumps and pinpoint where you’ll land. Also, when playing with a friend, the screen does get a bit cluttered, making it sometimes hard to see where your character is. You’ll notice that the game has limited content, as it only offers fourteen different boss fights. While some take several tries to plow through, the game could have used a bit more content, or perhaps a variety on the available bosses. That being said, the content that is present is actually very good and all the bosses feel unique and have their own quirks, powers and difficulties. We just wish there was a bit more meat to the game. Mechstermination Force may be low on content, but what’s there is great. It may take some time to get used to the somewhat wonkier control scheme, but you’ll certainly enjoy this game, especially when playing with a friend. 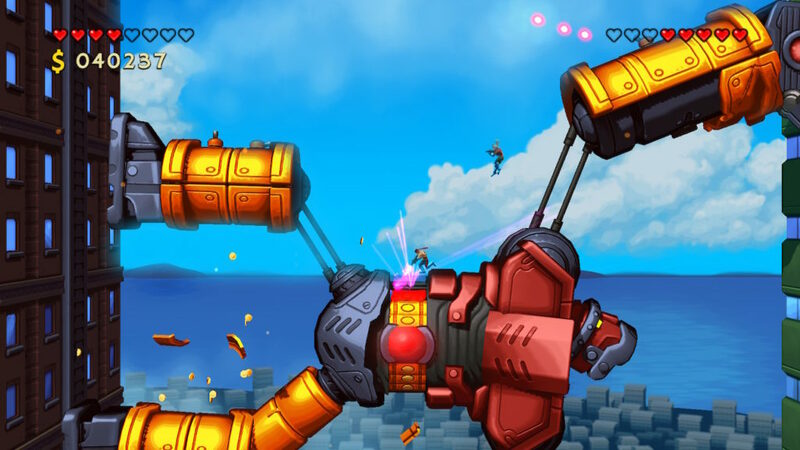 You’ll have a fun time dismantling all the giant mechs that are thrown your way, and it’s fun to unlock new items and weapons throughout your short-lived but action-packed journey to save the world.